Size 36X30. # CALVIN KLEIN. front rise 11". back rise 15". length 40". # CALVIN KLEIN. front rise 10". back rise 13". length 37". size 32x30. COLOR: Gray / Grey. SIZE: L with 28" inseam. Calvin Klein. Blue Straight Leg Pants, Flat Front. Color: Blue. Item Specifics 3% Elastane. Size: 34x32. 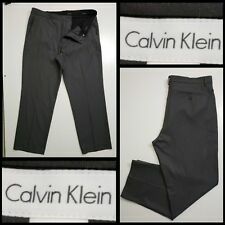 Calvin Klein Slim Fit Soft Pants. Item is in good condition. Calvin Klein Linen Blend Pants. Beige Tan, Pleat Front, Roll Cuff. Calvin Klein Beige Tan. Khaki 5 Pocket Full. Cotton Straight Pants. Gently used condition, see pictures. Inseam:28.5". Excellent pre owned condition. Reasonable offers will be considered. PAYMENT MUST BE RECEIVED WITHIN 3 DAYS Be sure to check out my other items. I will combine shipping when possible. Just add items to your cart and request an invoice. Smoke free home Please look at all pictures as they are part of condition description. # CALVIN KLEIN. length 40". inseams 28". back rise 14". Flat front, partially lined pants with unfinished hem. Extra-slim fit: tapered-leg trousers. Super fast service. 82% Polyester 16% Rayon 2% Spandex. Super fast service. Button-through back welt pockets; slant front pockets. Zip fly with hook-and-eye closure. model height: 6'1" and he is wearing a size 32. Flat front. Super fast service. Unfinished hem. 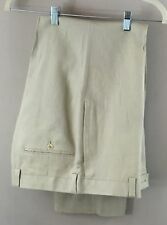 Trousers have zip fly with button closure;. Front slant pockets;. 100% Wool; dry clean. Flat front. Back welt pockets. Super fast service. Maximize your professional presence with this slim-fit charcoal suit pants from Calvin Klein. Slim trousers with a tapered leg. Flat front, partially lined pants with finished hem. Super fast service. Pants: Flat front; zip fly with hook and button closure; slant-front pockets; back welt pockets with button closures; partially lined. Super fast service. Tapered-leg trousers. Flat front; zip fly with button-and-hook closure; side slant pockets. Calvin Klein. Super fast service.